MSV: Next stop for Timmy Occhipinti: Recall! Next stop for Timmy Occhipinti: Recall! Confirming what many see as inevitable, the two mayoral candidates not anticipated to see victory in the mayoral race have been in a present and future face-off of sorts, first for who will be in second place this November and then the expectation it will bleed over long after the Hoboken mayoral contest is over and Mayor Zimmer sees re-election. MSV outlined the coming bad blood between Ramos and Occhipinti last January in their emerging Cold War in a Grist for the Mill story. The Political Insider column on Saturday acknowledged this likelihood and made reference to the bad blood between the Old Guard camps. Assemblyman Ruben Ramos all but announced his intentions to run for Hoboken mayor last winter at the beginning of the year and the Raia-Mason slate jumped in right after Labor Day at the deadline making the long shot for the Ramos campaign far harder splitting the voter base both sides desperately needed in building any winning coalition. 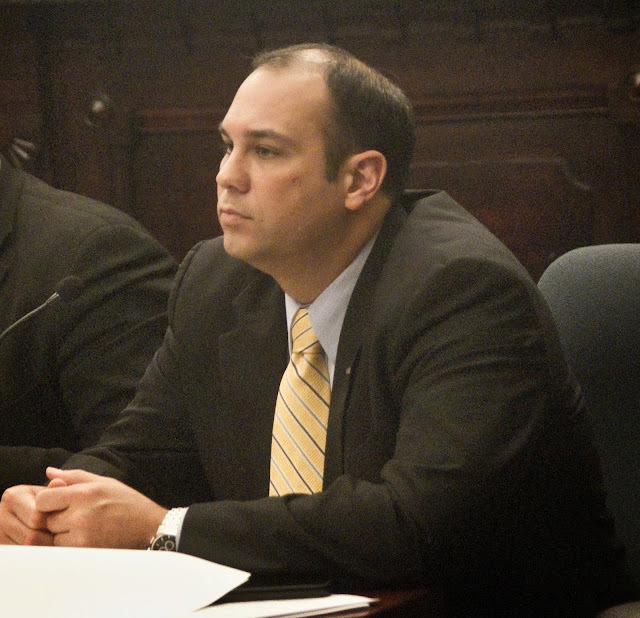 After the Hoboken municipal election, look for Assemblyman Ruben Ramos to go after Tim Occhipinti's council seat and, unless Frank Raia gets on the City Council in November, look for Raia to then target Michael Russo's council seat. The animosity is getting that bad. What the column didn't identify is when Assemblyman Ramos will make his move. The fourth ward council seat is up in 2015 but Ramos clearly has marshaled his allies to get behind him in the Hoboken Housing Authority and Occhipinti got a taste of it but on the receiving end Wednesday night. The Carmelitos would oooh and awww at anything favorable to Ramos during public portion. It was a reality check for Occhipinti who loved to play to the mob when he thought he was their guy. From the sounds of it, the whispers are Assemblyman Ramos has some other ideas with the "Education of Timmy Occhipinti," the new game in town. With the Ramos campaign already mobilized in a war going up against the Vote-by-Mail machine, what better way to keep his fourth ward base engaged after November 5th? isn't going to forget what one supporter called Occhipinti "stabbing him in the back"
Talking Ed Note: Frank "Pupie" Raia is also mentioned as a possible candidate in the third ward going up against Councilman Michael Russo. If Raia is not successful in his council at-large bid, he'll be motivated for payback too. For years Raia has been expected to support the Russo family in their election actions but his camp never sees anything resembling reciprocity. The Russo clan notorious for never laying out a dime, (the ATM only works in one direction) have benefitted often over the years by Raia's largesse. While the "family business" as they call Hoboken government is a cash machine they tap into whenever possible, even the Mason family's bottomless checkbook may not be available much longer. Beth Mason perhaps finally figured out it's better to partner with someone who will share the financial load for mutual political objectives then vacuum the Mason checkbook endlessly as she spins her wheels into political oblivion.